This weekend I watched Scorsese's film, The Grifters, and was loving Annette Bening's style. So many 80's-40's style nods. Like this cropped jacket and the red scarf around the head. Hello Audrey. And did I mention the cheetah? 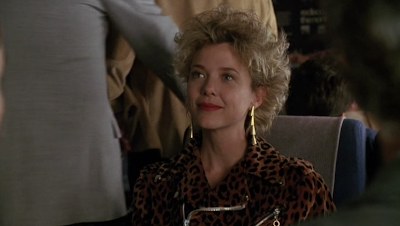 Home girl wears a different Cheetah outfit for like 4 scenes in a row. She is even wearing skinny cheetah denim WITH a cheetah belt. I swear we have those same exact pants coming in fall from Dolce Vita. But let's face it. Cheetah has been MAD popular since the 40's. And then it became illegal to hunt cheetahs (this is good) and we got lots of repro's. (not mad) I actually own some real cheetah, it is super weird. But you know, if it wasn't loved today, it was a total waste. So check out these outfits and plan your fall 2012 wardrobe accordingly. I love head wraps like this. I can't pull it off but I always love it. Anyhow, I highly recommend watching this movie, super good.